First of all I would like to give credit to Docker which motivated me to write this blog, I've been using docker for more then 6 months but I always wondered how things are happening behind the scene. So I started in depth learning of Docker and here I am talking about Namespace which is the core concept used by Docker. Before talking about Namespaces in Linux, it is very important to know that what namespaces actually is? Let's take an example, We have two people with the same first name Abhishek Dubey and Abhishek Rawat but we can differentiate them on the basis of their surname Dubey and Rawat. So you can think surname as a namespace. In Linux, namespaces are used to provide isolation for objects from other objects. So that anything will happen in namespaces will remain in that particular namespace and doesn't affect other objects of other namespaces. For example:- we can have the same type of objects in different namespaces as they are isolated from each other. In short, due to isolation, namespaces limits how much we can see. Now you would be having a good conceptual idea of Namespace let's try to understand them in the context of Linux Operating System. Linux namespace forms a single hierarchy, with all processes and that is init. Usually, privileged processes and services can trace or kill other processes. Linux namespaces provide the functionality to have many hierarchies of processes with their own "subtrees", such that, processes in one subtree can't access or even know those of another. A namespace wraps a global system resource (For ex:- PID) using the abstraction that makes it appear to processes within the namespace that they have, using their own isolated instance of the said resource. In the above figure, we have a process named 1 which is the first PID and from 1 parent process there are new PIDs are generated just like a tree. If you see the 6th PID in which we are creating a subtree, there actually we are creating a different namespace. In the new namespace, 6th PID will be its first and parent PID. So the child processes of 6th PID cannot see the parent process or namespace but the parent process can see the child PIDs of the subtree. Let's take PID namespace as an example to understand it more clearly. Without namespace, all processes descend(move downwards) hierarchically from First PID i.e. init. If we create PID namespace and run a process in it, the process becomes the First PID in that namespace. In this case, we wrap a global system resource(PID). The process that creates the namespace still remains in the parent namespace but makes it child for the root of the new process tree. 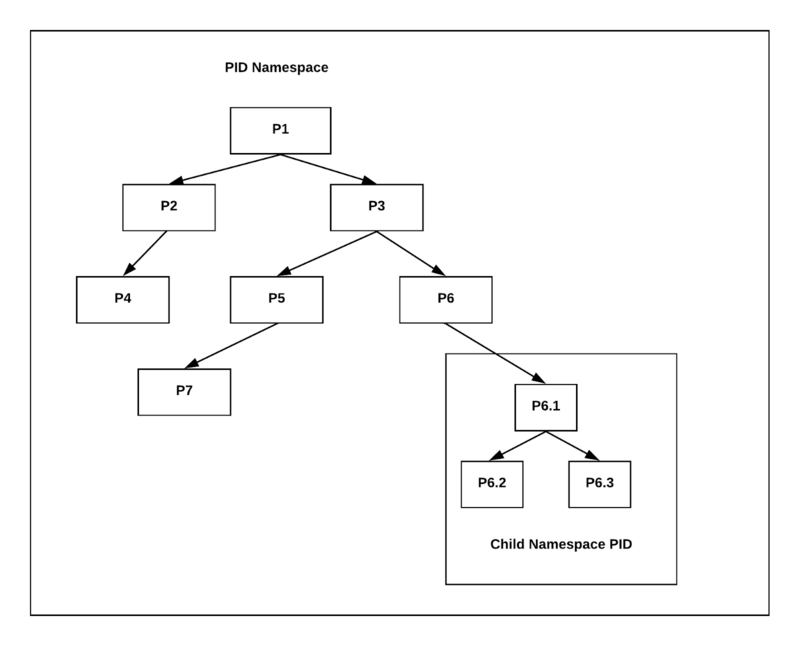 This means that the processes within the new namespace cannot see the parent process but the parent process can see the child namespace process. The docker logs command batch-retrieves logs present at the time of execution. The docker logs command shows information logged by a running container. The docker service logs command shows information logged by all containers participating in a service. The information that is logged and the format of the log depends almost entirely on the container’s endpoint command. These logs are basically stored at "/var/lib/docker/containers/<container_id>.log", So basically it is not easy to use this file by using Filebeat because the file will change every time when the new container is up with a new container id. So, How to monitor these logs which are formed in different files ? For this Docker logging driver were introduced to monitor the docker logs. Docker includes multiple logging mechanisms to help you get information from running containers & services. These mechanisms are called logging drivers. These logging drivers are configured for the docker daemon. To configure the Docker daemon to default to a specific logging driver, set the value of log-driver to the name of the logging driver in the daemon.json file, which is located in /etc/docker/ on Linux hosts or C:\ProgramData\docker\config\ on Windows server hosts. Because all the logs have been parsed to the destination. and parse those logs onto Elasticsearch and viewed them on Kibana. In this case I am configuring the logging driver at the run-time by installing the logging driver plugin inside the fluentd but not in daemon.json. So make sure that your containers are created inside the same docker network where you will be configuring the logging driver. Step 1: Create a docker network. Step 2: Create a container for elasticsearch inside a docker network. Step 3: Create a fluentd configuration where you will be configuring the logging driver inside the fluent.conf which is further being copied inside the fluentd docker image. This will also create an index naming as fluentd & host is defined in the name of the service defined for elasticsearch. Step 4: Build the fluentd image and create a docker container from that. Here the logging driver pluggin is been installed and configured inside the fluentd. Now build the docker image. And create a container. docker build -t fluent -f Dockerfile.fluent . Step 5: Now you need to create a container whose logs you want to see on kibana by configuring it on the run time. In this example, I am creating an nginx container and configuring it for the log driver. Step 6: Finally you need to create a docker container for kibana inside the same network. Now, You will be able to check the logs for the nginx container on kibana by creating an index fluentd-*. none: No logs are available for the container and docker logs does not return any output. json-file: The logs are formatted as JSON. The default logging driver for Docker. syslog: Writes logging messages to the syslog facility. The syslog daemon must be running on the host machine. journald: Writes log messages to journald. The journald daemon must be running on the host machine. gelf: Writes log messages to a Graylog Extended Log Format (GELF) endpoint such as Graylog or Logstash. fluentd: Writes log messages to fluentd (forward input). The fluentd daemon must be running on the host machine. awslogs: Writes log messages to Amazon CloudWatch Logs. splunk: Writes log messages to splunk using the HTTP Event Collector. etwlogs: Writes log messages as Event Tracing for Windows (ETW) events. Only available on Windows platforms. gcplogs: Writes log messages to Google Cloud Platform (GCP) Logging. logentries: Writes log messages to Rapid7 Logentries. This blog introduces you to ECS service provided by Alibaba cloud. After reading this blog you will be able to deploy your own ECS instance in no time. environment that includes CPU, memory, and other computing components. If you have already used AWS then you can compare ECS with EC2. What are the advantages of ECS? occur internally and are done by employees. Cloud providers allow you to easily modify your IT requirements as and when required. Before creating an instance you must create a security group and key pair. in a particular region, will only be available in that region. How to create a security group in Alibaba cloud? 1. Log on to the ECS console. 3. Click “Create Security Group”. Template: If the instances in the security group are for Web server deployment. Select proper template to simplify security group rule configuration. Security Group Name: Specify a valid security group name. Description: Give a brief description to the security group for future management. To create a classic network-connected security group, select Classic. Alibaba Cloud, which is responsible for its planning and management. To create a VPC-connected security group, select VPC and then a specific VPC. IP addresses in a VPC. 5. Click OK to save the rule. example application is for remote login to computer systems by users. How to create key pair in Alibaba cloud? 2. In the left-side navigation pane, select “Networks and Security” and then “SSH Key Pair”. 3. On the SSH Key Pairs page, click “Create SSH Key Pair”. How to create ECS instance in Alibaba cloud? 1. Log in to Alibaba cloud console. 2. Select “Elastic Cloud Service” and then select “Instance”. 3. Click on “Create Instance”. 4. Choose the billing method, region, instance type, image and storage. Billing method - There are two billing methods. 2. Pay as you go - In this method you will be billed on hourly basis. Region - It defines in which region and availability zone you want to deploy your instance. Image - It lets you select the Operating system and its version. Storage - Allocate the required amount of disk space. After completing all the above, click on “Next: Networking”. VPC - A virtual private cloud is a virtual network dedicated to your account. It is logically isolated from other virtual networks in the Cloud. VSwitch - It is nothing but a subnet of the network. Public IP - It is the IP address with which you can access your instance. After completing all the above click on “Next: System Configuration”. fill the instance name, description and host. 7. Click on Preview and then Create Instance. 8. After instance has been created you can log into the instance using pem file.